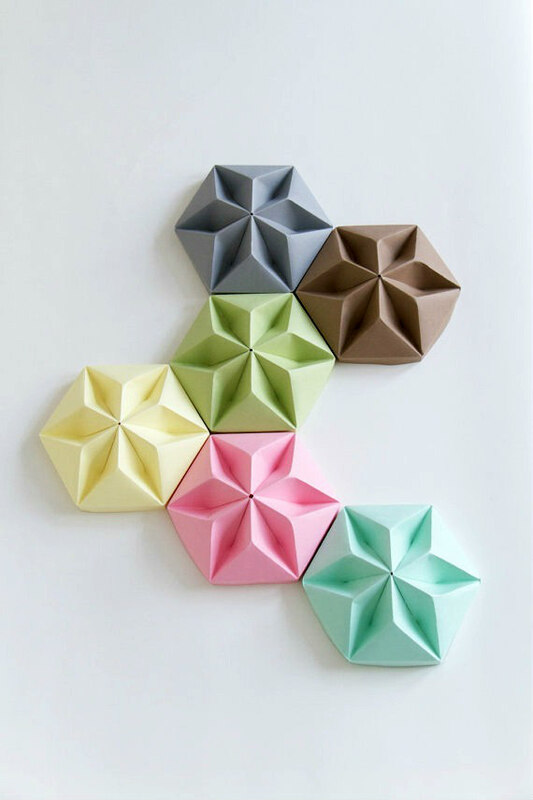 I spotted these pretty origami ceiling cups in an Etsy email and knew right away they had to be from Studio Snowpuppe. A fresh take on antique pendant light ceiling medallions, the color grouping will even look great as wall decor if you don't have a chandelier handy. Nellianna van den Baard, an architect, and Kenneth Veenenbos, an industrial designer, are the creative duo behind Studio Snowpuppe, located in The Hauge, Netherlands. Kroonuppe ceiling roses are new to the product line and perfectly compliment their Moth and Chestnut diamond folded lampshades. 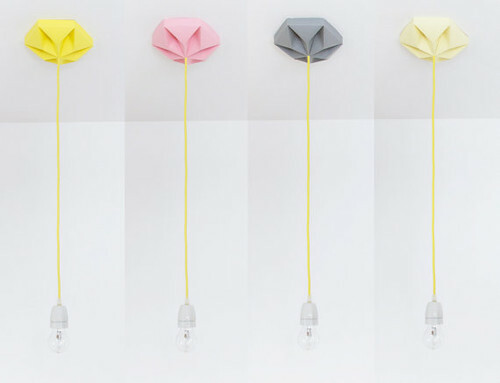 Created from a sheet of sturdy paper, the rose simply slips over a light bulb and slides up the cord to the ceiling. I asked if there is any need to adhere it in place. Nellianna assured me that the rose clamps itself around the cord and sits firmly against the ceiling. A clear washer is sent along to ensure the rose will not slip down the cord if the paper should lose a bit of its stiffness due to wind or humidity. There is also a small plastic cup that fits inside the rose. 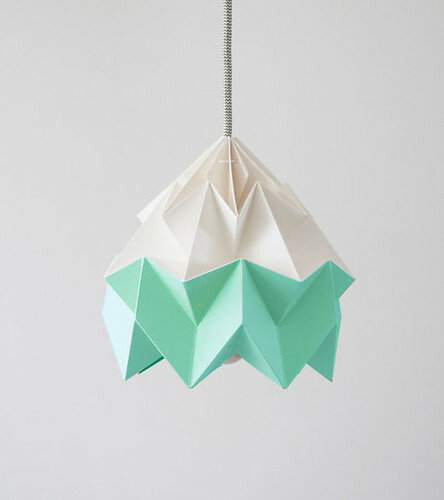 The beauty of these shades (aside from their literal beauty) is that the folded paper brings a warm glow to the chilly light of energy-saver bulbs. 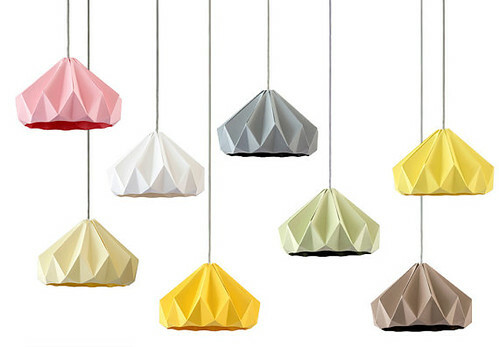 Can't you picture one of these lampshades with a matching ceiling rose above it? Perfecto! Studio Snowpuppe is on Facebook, Twitter, Pinterest, and Instagram. Have a lovely weekend. I'm happy to say spring has sprung here in the northeast and hope it's nice where you are too! This is not a sponsored post... it is my opinion, written after receiving a ceiling rose. Such clever folded designs. The ceiling roses will make great wall decor too. Folded paper can be turned into such beautiful designs!!! These are beautiful! I love the graphic lines and the pastel colors. I agree, they would make a great art piece! Very beautiful :) Is tutorial available for this? Sorry, this isn't a DIY. 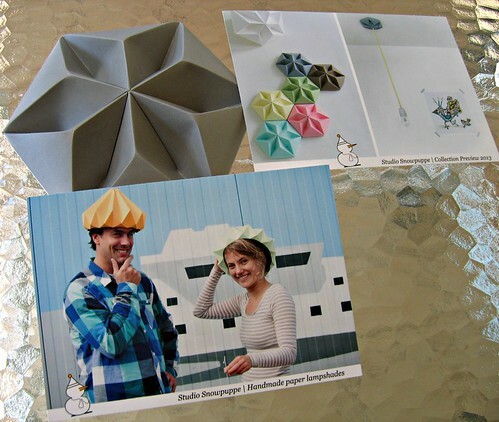 Creating origami lights is Studio Snowpuppe's livelihood.